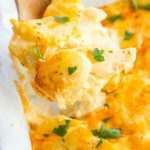 This creamy Dorito Chicken Casserole is a recipe that your entire family will love. Made with a casserole dish full of Dorito chips and topped with a creamy chicken mixture. This one will be a winning dinner! 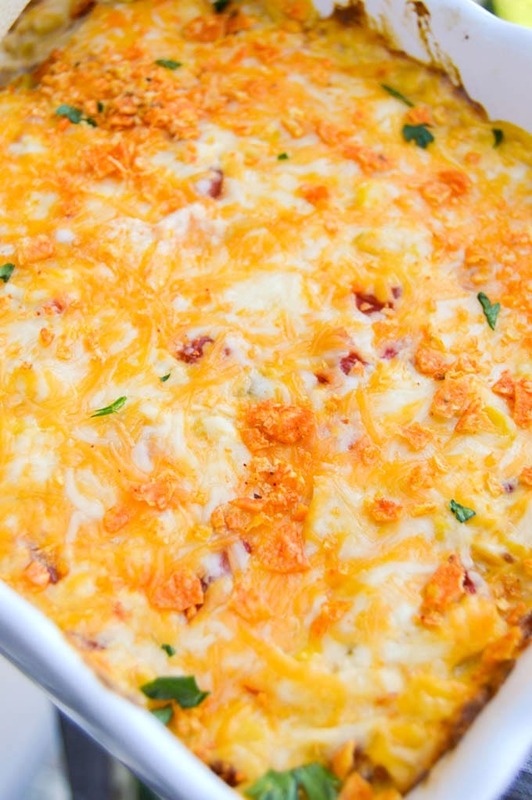 This Dorito Chicken Casserole is a family favorite! My kids loved it and my husband asked when it would be on the menu again. I guess it’s no surprise since they LOVE my cheesy ham and potato casserole. I guess cheesy casseroles are a favorite in my home. 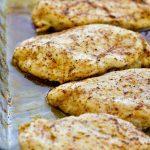 For this recipe, you want to start by cooking your chicken breast. This recipe is perfect for a rotisserie chicken. Once that is done you just mix everything up and top it with cheese before you bake. It’s pretty simple. 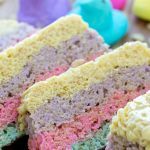 This recipe is so simple to make! 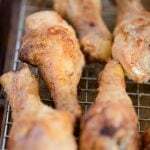 You want to start by cooking your chicken or use precooked and shredded chicken. If you are starting with raw chicken I wrapped mine in foil and baked. This way I could take it out and have a clean casserole dish to use for the rest of the recipe. Once your chicken is cooked shred it and set it aside. Time to start building the casserole. Crush chips and place them on the bottom of your casserole dish and set aside. I reserved 1/4 cup for garnish to make it look pretty, but that’s just up to you. 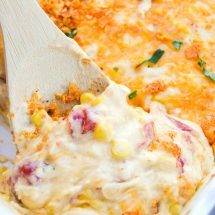 Mix together cooked shredded chicken, sour cream, cream of chicken soup, cheddar soup, Rotel, corn, and 1 cup of shredded cheese. Pour this over your chips in your casserole dish. All you need to do now is top with the remaining cheese and bake. 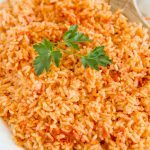 An easy recipe that you and your family will love. 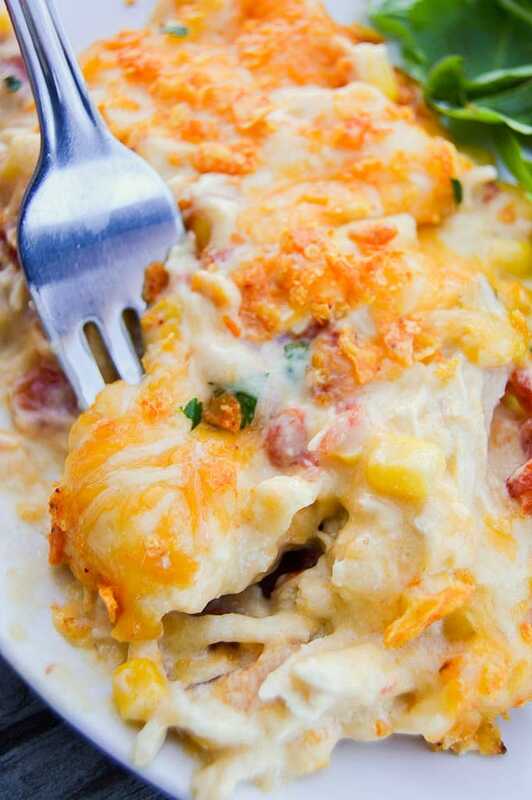 If you loved this recipe try some1 more of my favorite casseroles! Preheat oven to 375 degrees. Place foil in a casserole dish and place chicken inside foil. Cook for 20-25 minutes or until chicken is cooked through and tender. Shred chicken and set aside. Lower oven temperature to 350 degrees. Mix together cooked shredded chicken, sour cream, cream of chicken soup, cheddar soup, Rotel, corn, and 1 cup of shredded cheese. Pour this over your chips in your casserole dish. Top with remaining cheese and bake for 25-30 minutes. Optional: Top with reserved chips for garnish and enjoy. 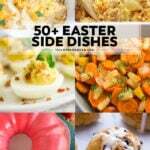 Jenine blogs at thediaryofarealhousewife.com where she strives to create simple recipes that anyone can make and everyone in the family can enjoy. As a mom of three she knows first hand how busy day to day life can be and how precious family time is. 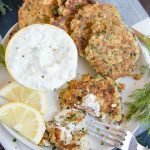 She hopes her easy recipes can help you spend less time in the kitchen and more time around the table enjoying food, family, and making fun memories. Will this still come out alright if I skip out on the can of Rotel? Or does skipping one ingredient change the taste of the entire meal? 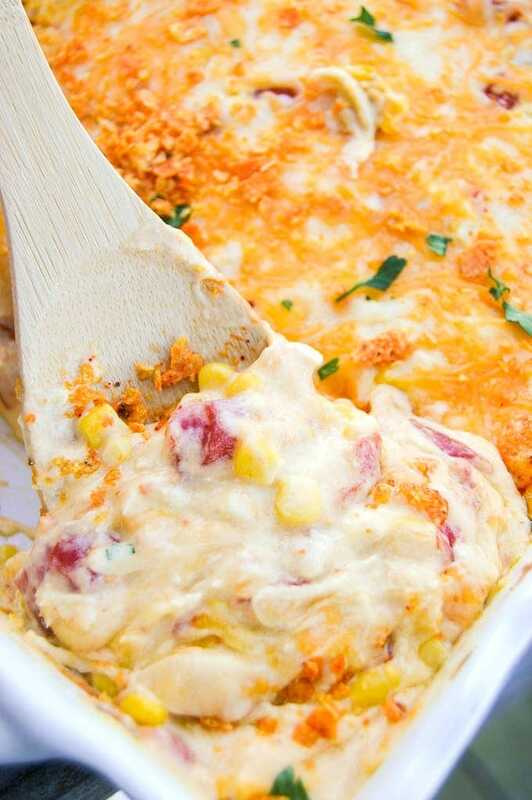 It depends on the ingredient, but Rotel is a big basis of the flavor in this casserole. Do you use nacho cheese Doritos? Yes, but you could use a different flavor if you like. Do the chips stay crispy when they are cooked in the bottom? They don’t come out crispy, just soft (but not mushy). You can add some crushed chips as a topping for texture if you like. Can I cook this in crock pot and not cook chicken first ? I’m not sure this exact recipe would work in a slow cooker. I noticed the recipe calls for Rotel. Is that tomatoes or what? I saved the recipe but would like to know what that is if I decide to make it. Yes, Rotel is a can of tomatoes with green chiles added. Can you make this a day ahead and put in the refrigerator or will the chips get soggy? I would worry that the chips would get quite soggy making it a day ahead. What do you serve on the side of this dish? Thanks! This is great with a crisp salad or some steamed veggies. I just made this casserole tonight. I used the rotisserie pre-cooked chicken. I am all about simple but love flavor. Everyone in my family loved it and came back for seconds. 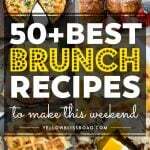 This recipe is a keeper and I will share it. I am making this for dinner tonight. I am disappointed the recipe is not complete. It does not tell you what size casserole dish to use. It does not tell you what size bag of Doritos. If someone wanted to use rotisserie chicken it would also be nice if it tells you what quantity the chicken in cups rather just in the number of breasts. Hi Janet, I’m so sorry for the confusion on the recipe. Here is the information you need. You will need a 9×13 casserole dish. If using a rotisserie chicken you could use 2 1/2 cups of shredded chicken. The size of the bag was the 9.75 oz. Hello!Tried this last night and it was delicious! Can you make the chicken mixture and split it in half and freeze half for later? With all the cream and cheese, I’d be cautious with freezing as sometimes the reheating can cause the sauce to break. But, it’s worth a try! HI there. Just wondering if you could update the instructions please. The top says 55min cook time, but in the recipe it says 20-25. Also, what about draining the can of corn prior to mixing with other ingredients? Thanks so much! It’s going in the oven soon and I used a rotisserie chicken for it! Can’t wait to try it! I see why the cook time is 55 at the top…juts thought about those that choose to cook their own chicken breasts! Yes the 55 minutes is for the total cook time of the recipe as is. Of course if you use your own pre-cooked chicken, you’d want to adjust the time accordingly. Hope your family liked it!